Pork ribs often need longer cooking time on stove top, but that will be shortened a lot if using an electric pressure cooker, like Instant Pot. No matter what kind of cooker you got, you can try this simple yet delicious dish without any fuss. Stove-top instructions are included beneath though. Kimchi is a traditional Korean side dish, yet quite versatile to be used in making various delicious and healthy dishes. 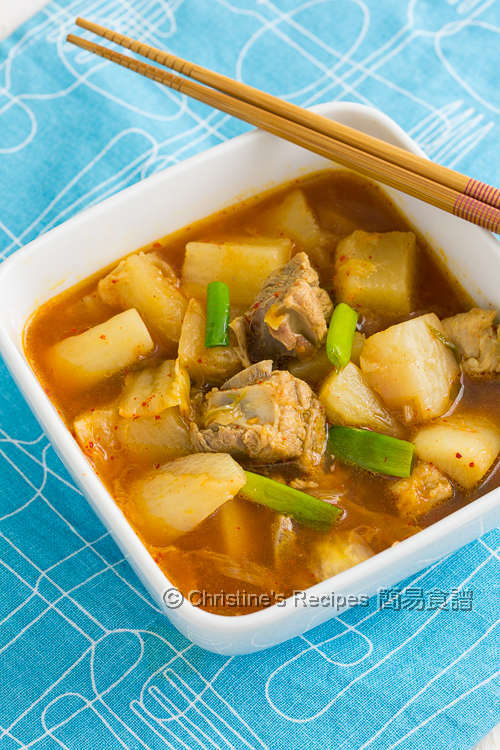 By adding some Kimchi in soup, it helps to create a depth of flavours, and the whole dish becomes very appetizing. 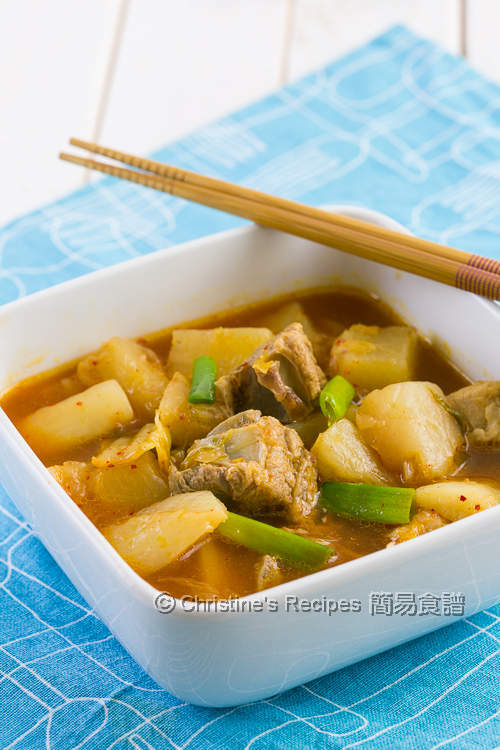 The natural sweetness of radish is blended so well in the pork soup. The slightly tangy taste of Kimchi will intrigue you to want more. In a wok or pot, put in pork ribs with enough tap water to cover. Turn on the stove heat to high to remove the blood. Cook until impurities and foam appear on water surface. Drain up the ribs. Rinse and drain well. Mix with the marinade. Set aside. Prepare your Instant Pot. Press the “Saute” (medium) to heat oil. Add the pork ribs and cook until all sides are lightly brown. Stir in the ginger and garlic. Add the wine, followed by the radish. Combine well. Pour in the chicken stock. Cover the lid. Turn the pressure handle to “sealing” position. 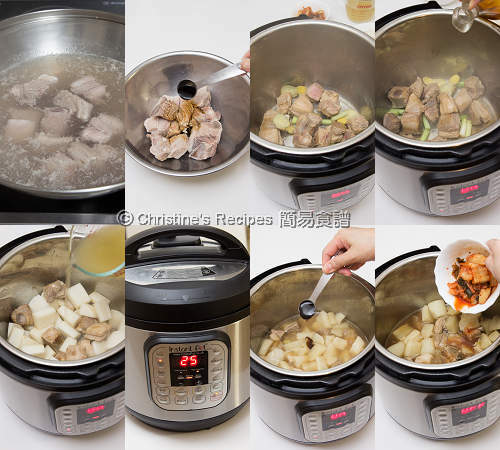 Press “meat/stew” button and cook for 20 minutes. Run quick release. When the valve drops, remove the lid. Season with the oyster sauce. Stir in the Kimchi. Sprinkle spring onion for garnish. Serve immediately. Put pork ribs with cold tap water in a wok. Turn on the stove heat to high to remove the blood. Cook until impurities and foam appear on water surface. Drain up the ribs. Rinse and drain well. Mix with the marinade. Set aside. Use a large pot. Heat oil over medium-high heat. Saute the pork ribs until all sides are lightly brown. Stir in the ginger and garlic. Add wine. Pour in 1½ cup of chicken stock. When it boils, reduce heat to medium-low. Cook until the pork ribs are softened. Increase heat to medium-high. Add in the radish. When it boils again, reduce to medium. Cook for another 20 minutes, or until the radish is tender. Replenish boiling water if needed. Stir in the oyster sauce and Kimchi. Garnish with spring onion. Serve immediately. After blanching the pork ribs, the impurities in pork bones are removed as a result that the soup will be clearer. Store-bought or homemade Kimchi can be used. Easy DIY Kimchi recipe can be found here. The ready-made Kimchi is available at Asian grocers or Korean shops. It must be very appetizing! The pork ribs look literally melt-in-mouth and tender. This is one of our family’s favorite recipes. So delicious! Thank you Christine for sharing such a delicious recipe! Glad that you liked this recipe. Happy cooking !